Crowns are used to cover the tooth and restore it to its normal shape and size. A tooth with a large restoration, lack of tooth structure, or a root canal can benefit from placement of a crown. Crowns are used for strength, appearance or to attach bridges. 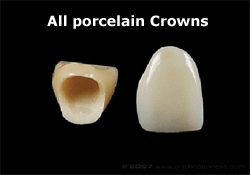 Our crowns are fabricated from porcelain fused to high noble metal, gold, or all porcelain. 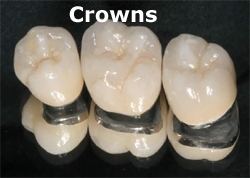 In most instances our doctor will determine which type of crown material is best for your tooth.